Is this live blogging a waste of time since it is a last-minute, unannounced exercise in futility? Let’s find out … together. Where it stands at the half: Auburn hasn’t trailed the entire game. The score? 43-32. According to our SEC Network announcers, the Tigers are 7-0 this season when leading at the half. How is this happening? Vandy is a HOT team coming into this game. A lot of folks have been throwing around their name as a dark horse in the SEC. A team that will probably be playing in the NCAA tourney. A team to beat. How the hell is Auburn out rebounding Vandy 21 to 10? 21 to 10!!! They look like giants under the board! But … they look slow and unresponsive so far. Auburn is flat-out playing better. “Cool Hand” Luke Hargrove (my boy!) is rolling with 12 points. One thing I’m worried about … and we’ll see where it takes us in the second half: 4 points from the bench for Auburn; 8 points for Vandy. The buzzer sounds. And here we go: THEE SECOND HALF. WAR EAGLE! Let’s beat Vandy on the road Tigers! Bad pass inside … Vandy gets the ball but turns it right back over to the Tigers. Another bad pass inside for the Tigers and Vandy takes it down to score 45-37. Easy points by Vandy on the other end 45-39. Crap. 16:31 — Easy points inside by Auburn and then answered quickly by Vandy. Twice. 46-43. Vandy has worked it inside for easy looking buckets. Auburn has just called time out. Vandy’s Ogilvy has come alive. 11-2 run and Vandy has pulled it in close. 4 points separate these teams now. Auburn fouled. 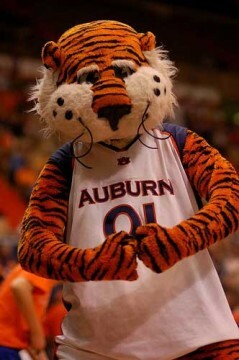 Hit this free throws Auburn! 1 in … and that’s 2! The crowd is quieter now. Auburn with the ball and turns it over. But the score is now 49-43. TV time out with 15:44 left in the game. Let’s see if Auburn can stop Vandy from working it in to Ogilvy again. He has 4 points this half so far from underneath buckets. Hargrove fouls and Vandy scores too. Drains the free throw and the Tigers only lead by 3 now. 49-46. Sullivan called for the charge on the other end. Oh no! Reed!!!! Takes it inside for the hard layup. 51-46. Ogilvy … Ogilvy … again with the rebound and bucket. 51-48. 6 points for Ogilvy in the second half. Auburn’s Sullivan fouls after the Tigers score on the other end. 53-48 with 13 minutes left in the game. The crowd is loud and back in the game. Hargrove throws it away. Auburn leads 53-50 but the momentum is swinging toward Vandy. Easy 2 by Vandy 53-52. Vandy takes the lead with a 3-pointer … and my live feed goes out. Tech difficulties by the SEC Network … fixed. Vandy has the lead 55-53. Vandy is playing physical and tough now. Auburn is playing sloppy ball and is being out-rebounded like crazy now. Making 1 of 2 free throws does not help. 10 minutes left. Auburn trails 54-57. ESPN360 is still not working … dang. Clearly, I’ve jinxed the whole thing. Why oh why did I decide to do this?! Vandy is pulling away … 61-54 … It’s the Jeffery Taylor show for Vandy. In 30 seconds time Taylor has an assist, a steal and two points at the other end. Four Commodores are in double-digits now. Tech difficulties continue apparently … but it is 63-58 Vandy with a little over 7 minutes left. Points off the bench so far: Auburn — 9 points; Vandy — 15 points. 5 minutes left … Vandy up by 9 after AUBURN MISSES BOTH FREE THROWS. You are killing us Tigers! Vandy by 11 … Lebo calls a timeout. “This team [Auburn] is a little gassed.” You think? 3:21 on the clock. Auburn down by 11. Auburn is ice cold folks. DeWayne Reed has been quiet this half. Totally opposite of his outstanding performance in the LSU game. Auburn down by 9 with 3 minutes left. Cool Hand Luke drains one free throw … misses the next … Auburn misses the easy bucket … Vandy passes it down for an EASY SLAM DUNK. Another basket by Vandy … this game is over and out of hand. The 75-63. 2 minutes left. Ogilvy is fouled and at the line. Auburn is down by 9 again. Ogilvy with another bucket and a huuuuuge block on the other end. That dude is pretty amazing. Ogilvy fouled by Auburn. Misses his first … misses his second. And Vandy is fouled again with 47 seconds left. Put a bullet in its brain! Sloppy. Just sloppy. This second half is painful to watch. Thankfully it will all end soon. Whatever dust had settled on Vandy because of not playing for a week … clearly they shook it off and strangled Auburn in the second half. And that’s the end. Vandy 82, Auburn 74. I’d definitely do this again. (Maybe with a lot more notice next time?) If anything this can be a placeholder for comments about the state of Auburn b-ball. Have at it! I was foolish to think that Auburn would be able to win 2 back to back on the road. Playing Kentucky tough at home and then going on the road to beat LSU … (then whipping Vandy in the first half) I guess the Tigers had to coming crashing back to Earth sometime. Auburn had 7 players come off the bench … but only 3 of them put any points on the board. Vandy had 4 guys coming off the bench with 3 of them scoring 4 points or more. Auburn actually had more rebounds … but I’m sure that Vandy had more in the second half. The Commodores worked it in down under the basket in the second half. It was like they finally realized that they had the bigger guys. Vandy doubled the Tiger’s four steals … Vandy had 5 blocks to Auburn’s one block. Good luck the rest of the way to Vanderbilt. They look like they could be giving the Vols and Wildcats a run for their money in the SEC East. They are now 4-0 in SEC play … but the have to play at Tennessee four days from now. Huge, huge game. Auburn (1-4 in the SEC) now goes back home to play a #24 ranked Ole Miss team and then another home game against a Bama team that knocked off Miss St. this afternoon. Ole Miss has a 3-2 record in the SEC with a loss coming to Miss St. at home and and overtime loss at Tennessee. (Both great teams.) It doesn’t so look good for Auburn. Can Auburn take one of those games? War Eagle! Shug Life … is … outta … herrreeeeeee. ESPN’s SECtv feed crapped out too. Not too disappointed given the direction things were heading. This is why I wonder why we even bother fielding a men’s basketball team. It is a total waste of resources. We could probably quadruple the assistant football coaches’ salaries and get real results. Ugly … just ugly. The feed is back Alex. And you are right. Probably best if we were left in the dark. Stinks! Stinks! Stinks! When you put a basketball team on the court that lives by the 3-point shot with no inside game then you get the same as a football team that can only pass and has no running game. See Florida. See Texas. In my opinion Lebo is just to lazy to recruit and sell the Auburn program to potential recruits in state. How many recruits are leaving the state to play elsewhere? Got news for the powers to be at Auburn; a new arena is not going to make Jeff Lebo a good coach.